Gold Standard, a New York company that buys jewelry, that it feels like Christmas in August. Uncle Ben’s Pawn Shop in Cleveland has never seen a rush like this. Welcome to the new American gold rush. The price of gold is on a remarkable run, setting a record seemingly every other day. Stomach-churning volatility in the stock market this month has only made investors covet gold more. Some want it as a safe investment for turbulent times. What worries some investors is that many others are buying simply because the price is rising and they want to make money fast. “Is gold the next bubble?” asks Bill DiRocco, a golf company manager in Overland Park, Kan., who shifted 10 percent of his portfolio earlier this year into an investment fund that tracks the price of gold. He stopped buying because the price kept rising. In October 2007, it sold for about $740 an ounce. A little over a year later, it rose above $1,000 for the first time. This past March, it began rocketing up. On Wednesday, it traded above $1,793 an ounce, just shy of last week’s record of $1,801. Meanwhile, stocks, despite rising sharply in the last two and a half years, are only slightly higher in price than they were a decade ago. Since hitting a record high in October 2007, the Standard & Poor’s 500 index is down 23 percent. Gold hits a sweet spot among the elements: It’s rare, but not too rare. It’s chemically stable; all the gold ever mined is still around. And it can be divided into small amounts without losing its properties. Since the financial crisis in 2008, central banks around the world have bought gold as a hedge against their foreign currency holdings. Earlier this month, South Korea announced it had bought gold for the first time in more than 10 years. Gold is “an effective hedge in a world where there is too much debt and uncertainty,” says Jim McDonald, chief investment strategist at Northern Trust, which owns $2.8 billion of gold in a gold fund. The last time gold prices rose so precipitously was a few years after President Richard Nixon ended a decades-long fixed relationship between the value of the dollar and the value of gold. In those days, the price of gold was fixed at about $35 an ounce. And many foreign currencies were pegged to the dollar. Gold gave the dollar its value, and the dollar gave everything else value. Then the U.S. began running a trade deficit, and dollars piled up abroad. Central banks could redeem dollars for gold. But it was a poorly kept secret that the U.S. didn’t have enough gold to cash out every dollar in circulation. To head off a rush, Nixon “closed the gold window,” essentially saying that confidence in the U.S. government, not gold, gives the dollar its value. Gold and the dollar began to rise and fall freely, and gold earned its place as protection against the falling dollar when confidence lags. As inflation worsened later in the 1970s and dollars were worth less, the price of gold took off. Gold hit its high in 1980 – $850 an ounce, or more than $2,300 in today’s dollars. This time is different because gold is rallying against all currencies, not just the dollar, says Jim Grant, editor of Grant’s Interest Rate Observer. Gold prices will probably keep rising until the U.S. and Europe get their finances in order, he says – and Grant doesn’t expect that to happen soon. He predicts inflation, low for the moment, will soar, further eroding the value of the dollar and leaving only gold as a good investment. Cetin Ciner, a professor of finance at the University of North Carolina-Wilmington, disagrees. He thinks gold is near a peak and people who buy now are blindly chasing the rising price. “I’m thinking of it as like the dot-com stocks,” Ciner says. Both Ciner and Grant caution, however, that when it comes to gold prices, no one really knows. That’s because gold doesn’t have intrinsic value. It doesn’t offer an interest rate, like a bond, or represent a share of a company, like a stock. It is inherently speculative as an investment: You only make money if the price goes up. Amy Robinette, who owns Gold Buying Girl, a network of 70 women in six states who throw parties for people to sell their gold jewelry, says her clients “don’t realize how much their gold is worth.” She gets a cut of the sales. Sharlett Wilkinson Buckner, of Humble, Texas, recently took an old bracelet, ring and necklace to her local jeweler and walked out with $1,070. The next day, he sold an old gold necklace for $650. If Peter Hug is right, this frenzy for gold is likely to continue. The director of the precious metals division for Montreal-based Kitco, one of the largest dealers of precious metals, says gold is no longer “just for the crazy people” – Henny Pennys expecting the sky to fall. 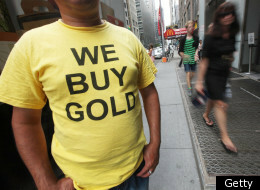 Hug says that until the U.S. tackles its debt and deficit problems, there’s no limit for the price of gold. “As long as people are terrified that their purchasing power is going to be eroded, gold goes to $3,000 an ounce,” Hug says. Whether or not prices climb that high, many people are deciding it’s as good a time as any to sell Grandma’s jewelry. Pawn shops and gold brokers report a surge of people cashing in their gold. In the past two years, Tansky, who runs Uncle Ben’s and is president of the Ohio Pawnbrokers Association, says gold sales have doubled or tripled. That figure actually masks how hot gold is right now, he says, because others who would have come to his store have gone instead to unlicensed brokers that are trying to cash in. He complained that he is being “harassed” by those who adopt the approach to money that has been labeled MMT. He conceded that on many issues he agrees with MMT conclusions — particularly in rejecting the hysteria about current US federal government budget deficits. I want to be clear that MMTers recognize and appreciate the role that Krugman has played in fighting against the deficit hyperventilators in Washington. However, he claimed he diverges from MMT’s insistence that “deficits are never a problem” and in particular that deficits will not become a problem when the current “liquidity trap” ends. At that point, Krugman fears, rising interest rates will rapidly increase servicing costs of federal debt beyond what our nation is willing and able to afford. He cites his dissertation that examined such a situation in the case of France after WWI. With insufficient tax revenue to pay the interest due, the government simply expanded the monetary base (essentially, “printing money”) that caused the exchange rate to collapse and inflation to soar. Now this is at least the third time that Krugman has claimed that MMTers say “deficits are never a problem.” He never cites anyone when he makes the false claim. And every MMTer I know has directly refuted his accusation; indeed Stephanie Kelton, Jamie Galbraith and I have all published responses on Krugman’s own blog denying that we believe any such thing. All of us have also published elsewhere detailed refutations, including my post at New Deal 2.0. These responses to Krugman have received wide circulation. His refusal to change his tune says more about him than about the MMT position. I will not go into the substance of Krugman’s argument about France because I know that other MMTers are providing a detailed analysis elsewhere. However, since Krugman wrote a dissertation on the topic, he must be aware that France’s position between the end of WWI and the beginning of the Great Depression bears no resemblance to the case of the US today. Like most countries, France abandoned the gold standard in the war, went back on gold after the war, and then finally abandoned it again in the Great Depression (it was the last major country to do so — those that went off gold earlier in the depression tended to recover more quickly). So France created a lot of monetary instability as it moved among monetary regimes, and as MMTers argue the gold standard does significantly restrain policy space — bringing into question government’s ability to afford its commitments. And it does not help to fight a world war within one’s borders. Hence, Krugman is just plain wrong to compare France’s situation in that period to the current and future case of the US. However, I do want to address Krugman’s feeling that he is being harassed by followers of MMT. Every time he writes about fiscal policy, he is flooded with comments and corrections from MMTers. It is true — take a look. What is truly remarkable about his post is not what he wrote. But rather it is the overwhelmingly negative response to his post. I recognize a few of the names and aliases of those who rose to the defense of MMT — regular commentators on New Economic Perspectives, Naked Capitalism, Great Leap Forward, New Deal 2.0, Huffington Post and other MMT-friendly blogs. However, there were many, many other missives posted by people unknown to me, from all over the country and even around the world. And most of them got it right. This is by way of saying that MMT has become a global phenomenon. To some extent, we know that. Why else would a Nobel-winning economist and featured columnist at the “newspaper of record” feel the necessity of refuting MMT? Five years ago, those of us who developed MMT could count our followers on the fingers of two hands. Now, NEP regularly gets over 3000 visits and page views daily. Many followers have set up their own MMT blogs. All the progressive social media sites feature MMT on an occasional basis. “Bing” MMT and you get over 50 million hits; “Google” it and you get over 28 million (I don’t know why Bing is more MMT friendly). Just a few short years ago, the only one I knew who blogged was Bill Mitchell. He (correctly) saw it as the future. I was highly skeptical. I wrote my first blog on invitation from TPM in 2008, and later joined ND2.0, and HuffPost regularly carried my writing after that. Yet, even after Stephanie Kelton created NEP, I still saw the blogosphere — or, social media — as something of a lark. Many or even most of the early comments were pretty silly, often by obsessed libertarians with almost no understanding of economics. Certainly this was no match for the New York Times as a source of reasoned analysis. But look where we are today. Take a look at the comments to Krugman’s post. I have no doubt at all that there are hundreds of MMT followers around the world who could go toe-to-toe with Krugman in a discussion of sovereign government finance. And win. And Krugman is the best that the NYT has. Social media not only helps to spread the ideas, but it also helps to develop, refine, and frame them. When MMT was confined to academic discussion among a few adherents and critics, it was necessarily limited by the shared background of the participants. We had the same parents, so to speak, in Smith, Marx, and Keynes. We had all heard the same stories designed to frame our views of economics, history, and policy. Exposing MMT to a broader audience, and — importantly — allowing that audience to respond to our writing forced us to think outside the box. Now, the same dynamic goes on in the classroom — or, at least, it should. I always found that when I must teach an idea, the interaction with students helps to sharpen my own thinking. But often that is still a fairly narrow slice of the population — usually younger people, and by self-selection an audience that will more readily accept what the professor professes (students are not randomly assigned to classes, after all). Social media opens the floodgates to, potentially, anyone with access to the web. It subjects ideas to the accumulated knowledge of humankind. Many of those are quite bizarre, of course. But there was a time when MMT, itself, was bizarre. Contrast that with corporate media (whether for-profit or “public”). Over the past year (at least) every time a National “Public” Radio or New York Times reporter introduces the topic of the US government deficit, she begins by noting that “everyone agrees, of course, that the deficit is out of control.” The debate is framed, and then two “competing” sides are introduced, with the only difference separating them concerning how quickly and by how much the deficit must be reduced. There is no chance for an alternative view; no one can instantly object that the reporter’s statement is patently false — as would be demonstrated by the hundreds of commentators who would readily disagree if given the chance. And many of those responding would be able to shred the two “competing” experts in a fair fight. Every time I hear Ken Rogoff featured on the radio (which is distressingly frequent), I know there are literally thousands of people around the world who understand finance much better than he does. (If you ever run into him, ask him if he has yet figured out what a CDS is.) Yet he gets to drone on about topics he knows nothing about — such as sovereign default risk — while facing no challenge. His anointed role is to push the agenda of the corporate media — which shields itself by circling the wagons and preventing access. Oh, sure, they might spend a couple of minutes a week reading a few selected letters. And they will occasionally give some “expert” (including yours truly) a few seconds on the air. But these exceptions pose no real alternative to the official message conveyed by corporate media. Fortunately, there is an alternative. And you are part of it. The Modern Money Cleaners Brigade. Don’t let up on Krugman.